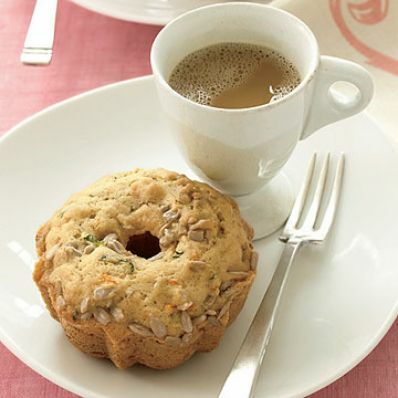 Zucchini and carrots make these small cakes moist and delicious. Prepare them in a mini bundt pan to set them apart from the rest of the muffins on your brunch table. 1 of 5 Heat oven to 350 degree F. Coat the wells of a mini-bundt or standard-size muffin pan with nonstick cooking spray. 2 of 5 Whisk together flour, baking soda, baking powder, salt, ginger, cinnamon and cloves in a large bowl. 3 of 5 Mix eggs, oil and sugar in medium-size bowl. Whisk for 30 seconds to dissolve sugar. Stir in shredded zucchini and carrot. 4 of 5 Stir egg mixture into flour mixture. Stir in sunflower seeds. Divide batter equally among wells, a slightly heaping 1/4 cup in each. 5 of 5 Bake at 350 degree F for 23 to 25 minutes or until crowned and lightly browned. Remove from pan to wire racks to cool.